Response: After a Sand Snake character is killed, kneel 1 influence to search your deck for 1 Sand Snake character, reveal it, and add it to your hand. (Kneel 3 influence to search for any number of Sand Snake characters and put them into play instead if The Red Viper was just killed.) Then shuffle your deck. Let's imagine that Red Viper just died and this was played. 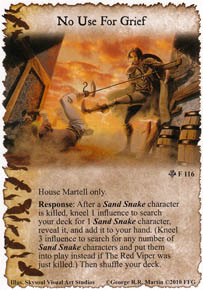 Would the Martell player get to bring out all of their Sand Snakes with duplicates or only one of each? My thinking for letting the dupes come out is because it says "any number" and so you can put out several of Obella (for example). Since only one copy of a unique can be out, then the others would attach to her. My thinking for only allowing one of each is that dupes can usually only be placed during the marshalling phase. Which is right? And since both of my reasons are probably wrong, why is the right one right? I am a total noob, so my opinion might no be correct at all, but I think that (as you said) duplicates are always "played" (or better said, "attached", as it is written in Rhaegal(core)) during the marshalling phase, and never "put into play" (which is the expression that is used in the card). Plus, the other option would be extremely powerful, and I don't think the game designers would allow such a thing. Sorry Enrico/Laxen, It is true that you can only "play" duplicates during the marshaling phase but you can use "put into play" abilities on unique characters you already have in play. They are immediately attached as a duplicate to the unique card. Duplicates are an exception to the normal play rules for playing and putting into play, so by using a put into play ability you are bypassing the normal timing rules to play duplicates the same way you bypass the normal timing rules for playing a non-duplicate card. So yes you can play alot of sand snakes and dupes with this card. Oops. I might have expressed myself a bit too confidently there. I was quite sure that the core rules stated that one could not "play or put into play" unique cards that you already controlled, but I guess I got I mixed up with something else. My bad. Well you'd actually need 3 influence to trigger the sand snake put into play part but yep it is powerful when you can get it to go off. "If you have a duplicate (another card of the same name) of a unique card in your hand but you already control and own a version of that card currently in play, you may attach the duplicate from your hand to the unique card in play, for no gold cost, during your marshalling." a card that you own and control)" that would avoid any confusion. "The rule for uniques say that you cannot play or put into play copies of unique cards you already have in play, except for duplicates. So duplicates can come into play as an exception to the usual limitation placed on unique cards. So if you have a "put into play" effect and you use it on a copy of a unique card you already have in play, that second copy enters play as a duplicate on the copy that is in play. This works for any "put into play" effect, including bringing unique cards out of Shadows." This is a nightmarish card to go up against and, aside from Stark's card blanking, the game is essentially over with that many sand snakes all buffing eachother at 3x each, tri-icon, stealth, deadly, dont kneel if they loose as defenders it's a pretty quick death too! I played against a sandsnake deck in melee and it won even since we all wildfired and valar and it still won hands down it was awesome to watch that deck in action. KotHH won't work for the combo. The Red Viper only gets his mass kill ability if you aren't running an agenda. With No Use for Grief you can't put into play Sand Snakes from your hand right? Is it only for deck searching? And if they are already in play (or your dead pile) you cannot search them either. If they are in play you can search for duplicates of them. A fair enough, I was remembering that wrong. I still get half credit right? I feel generous, have two-thirds credit! I vote for that it's OK to be wrong about this card every now and then. It's pretty much become the social norm. The Red Viper (PotS) is killed, I play No Use For Grief (DB). Which cards can cancel that response? May I then, cancel the cancel response and play another No Use For Grief (DB)? Wow thats actually quite many cards we currently have that can cancel such event. Now if you play another one you are not cancelling the cancel response (you could do that thou with your own cancel) its just completely new event being played. Yea, depending on the type of cancel they used (event, character ability or location ability) then you could cancel that triggered effect, which would mean your original NUFG event would still trigger. Or you can simply kneel more influence and play another copy of the event and hope they don't have another way of cancelling it. No Use For Grief (DB) combo with Red Viper is in action. Next opponent's plot is valar. So, assuming that you have one copy of every unique sand snake (you saved them with duplicates), you have a lot of non unique kills and let's say that it is in an early stage of the game. Do you think that it is a good plan? Can you win a game like that in regular circumstances?